Every year Arcaid Images presents an award to the architectural photographer whose winning image of the built environment exceeds in both photographic and architectural merit. 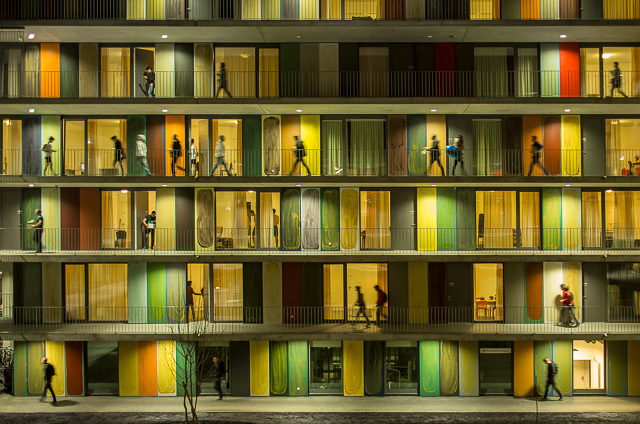 This year the overall winner was Portuguese photographer Fernando Guerra, with his stunning image of the EPFL Quartier Nord in Ecublens, Switzerland. Upon first glance, the awarded image compels not only in terms of linear composition and dynamic use of light, but particularly due to the human element that instils the building with a sense of life. In an interview while driving from his hometown Lisbon to do a shoot in Fátima, Fernando Guerra sheds some light onto his working methods. Guerra’s interest in photography stems from a young age, picking up his first camera as a 16 year old. Unsure of his artistic voice, young Guerra shot everything around him in an effort to find exactly what interested him in the surrounding world. He eventually trained as an architect and whilst working in Macao for 5 years, Guerra became increasingly enchanted with documenting street life. It is easy to see the influence of his early passion for street photography when looking at his winning Arcaid image, blending the rigidity and grandeur of traditional architectural images with the pulse and humanity found on the street. Indeed, Guerra believes his own style to be a sort of hybrid between certain elements of architectural and street photography, emerging out of the conceptual problems he encountered during his architectural education. Whilst the current ‘Instagram era’ has often been criticised for essentially turning anyone with a smartphone into a photographer, Guerra believes it to be a positive development for those in his field. The fact that most of his followers or ‘likers’ are neither architects nor photographers, is a testament to how many different types of people modern architectural photography can attract, and marks a definite shift away from the traditional, elitist conception of architecture as a relatively closed-off and homogeneous genre. Guerra’s philosophy reflects one of the core ideas behind Arcaid Images, namely that the experience of architecture for the majority of people is via images, and although photography is merely the medium, it is instrumental in documenting the built world in a format that is easy to share. Winning the Arcaid award came as a genuine surprise to Guerra, who says that he is usually on the other side of the spotlight, and was thus delighted to hear he had won. Perhaps his modest self-awareness parallels that of Portuguese architect and internationally reputed Alvaro Siza. Guerra says that Siza’s work was something that he studied extensively in architecture school, and he consequently never thought he would get to work for him. Their working relationship grew quickly from their first collaboration, but Guerra says it all happened very naturally, observing that Siza has none of the diva-like qualities certain celebrity architects in other countries have. Another great influence in his life has been the work of photography legend Henri Cartier-Bresson, whose working method reflects that of Guerra’s. Cartier-Bresson is perhaps most famous for coining the idea of the ‘decisive moment’ in photography, where form, composition and subject all coalesce to create the perfect image. Although the ‘decisive moment’ might only last a fraction of a second, careful planning and patience goes into creating the conditions for the perfect image. Of making the winning image, Guerra says that he spent 2 days studying the building, finding the right place to make photographs, and waiting for things to happen. According to Guerra, “you make your own luck when shooting,” but you need to put in the hours before you can expect anything. His winning Arcaid image is an impressive combination of formal architectural values and the crucial ‘decisive moment’. He believes there is a shift happening in architectural photography as a whole, where people now want to see the essential human element of the built environment, instead of just the building in isolation. Guerra’s working philosophy and winning image leave no doubt that he is a fitting winner of the 2015 Arcaid Awards.